Every individual who attends Apple Graphics Vehicle Wrap Training receives a Starter Supply Kit. The Kit has a value of $250 and is included in the Training. 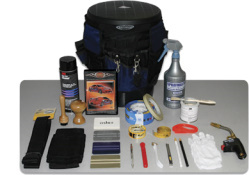 The Starter Supply Kit has all the necessary tools and more for you to get started wrapping vehicles. Everything you would need to wrap a vehicle on your own is included in the Starter Kit. Along with all these tools included in the Starter Supply Kit, and the experience that you gain throughout Apple Graphics Vehicle Wrap Training, you will be ready to wrap vehicles!